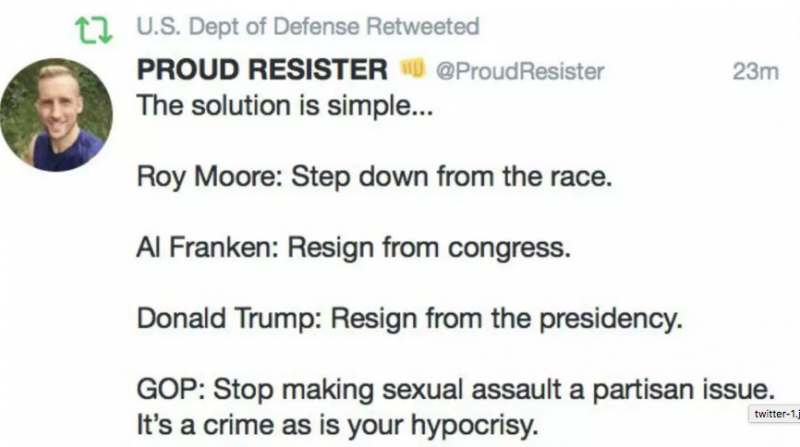 The Pentagon has said it "erroneously" retweeted a post calling for Donald Trump to resign. The Pentagon was quick to realise the situation - a spokesman, Colonel Rob Manning, said an operator of the account had "erroneously" retweeted content which wasn't endorsed by the Department of Defense. Manning said the individual cottoned onto the error and took it down immediately. The chief spokeswoman for the organisation, Dana White, posted this on her own personal Twitter page. There has been no comment from Donald Trump on the incident.